Gibberellins (GAs) are plant hormones that regulate many aspects of plant development including seed germination, stem elongation, flower induction, and anther development. Ca2+ is a ubiquitous second messenger involved in signal transduction of various environmental and developmental stimuli in eukaryotes. In response to diverse internal and external stimuli, cells generate transient increases in cytosolic Ca2+ ([Ca2+]cyt), varying in amplitude, frequency, duration, intracellular location and timing. One physiological response of plant cells to GAs is an increase in [Ca2+]cyt; however, previous studies using fluorescent Ca2+ indicators suggest that the increase occurs an hour to several hours after GA application, too slow for Ca2+ to act as a secondary messenger of GA signaling. We reexamined the effects of GAs on an increase in [Ca2+]cyt using the Ca2+ sensor protein aequorin in Arabidopsis (Arabidopsis thaliana). The GA-induced increase in [Ca2+]cyt occurs through the activation of Ca2+ channels within a few minutes, independently of DELLA (pathway a). The main pathway of GA signaling depends on DELLA degradation, which occurs >30 min after GA treatment (pathway b). Transgenic plants expressing aequorin were administrated with the active GA, GA4, showing a sharp increase in [Ca2+]cyt within a few minutes. In contrast, when inactive GA9-Me or GA8 was administered, no changes in [Ca2+]cyt were observed. GA concentrations of greater than 10-7 M triggered an increase in [Ca2+]cyt, but levels less than 10-8 M did not. This result is consistent with the GA-binding mode of the GA receptor, GA INSENSITIVE DWARF1 (GID1). Taken together, these results suggest that GA triggers a rapid increase in in a physiological concentration-dependent active form-specific manner. The Ca2+ channel blockers Co2+ and La3+ both had an inhibitory effect on the increase in [Ca2+]cyt, in a similar manner to EGTA chelation, suggesting a role of Ca2+ channels in the GA-induced increase in [Ca2+]cyt. DELLA proteins are negative regulators in GA signaling. GAs trigger DELLA degradation via the ubiquitin-proteasome pathway, thereby promoting plant growth. Arabidopsis contains five DELLAs, GIBBERELLIN-INSENSITIVE (GAI), REPRESSOR OF ga1-3 (RGA), RGA-LIKE1 (RGL1), RGL2 and RGL3, all of which display partially overlapping yet distinct functions in repressing GA responses. DELLA degradation was previously observed 30 minutes after GA administration. However, an increase in [Ca2+]cyt was observed within 5 minutes of GA treatment, suggesting that it occurred prior to degradation of DELLAs. RGA lacking 17 amino acids in its N-terminus (RGAΔ17) is not degraded even with GA treatment. An active GA-induced increase in [Ca2+]cyt was observed under RGAΔ17 expression. The pentuple mutant dellaP lacks all Arabidopsis DELLA genes. An increase in [Ca2+]cyt levels specific to active GA was observed in dellaP. These results suggest that GA induces an increase in [Ca2+]cyt independent of DELLAs. When GA was administered to transgenic Arabidopsis expressing a green fluorescence protein (GFP)-RGA fusion protein under control of the RGA promoter, GFP-RGA fluorescence in the roots disappeared. The Ca2+ channel blockers Co2+ and La3+ had no effect on the disappearance of GFP-RGA fluorescence, although they inhibited the GA-induced increase in [Ca2+]cyt. These results suggest that the GA-induced increase in [Ca2+]cyt and the degradation of DELLAs are independent processes. Our findings showing that the GA-induced increase in [Ca2+]cyt occur via a DELLA-independent signaling pathway provide important information on the GA signaling network. It is proposed that GID1 is the only GA receptor. 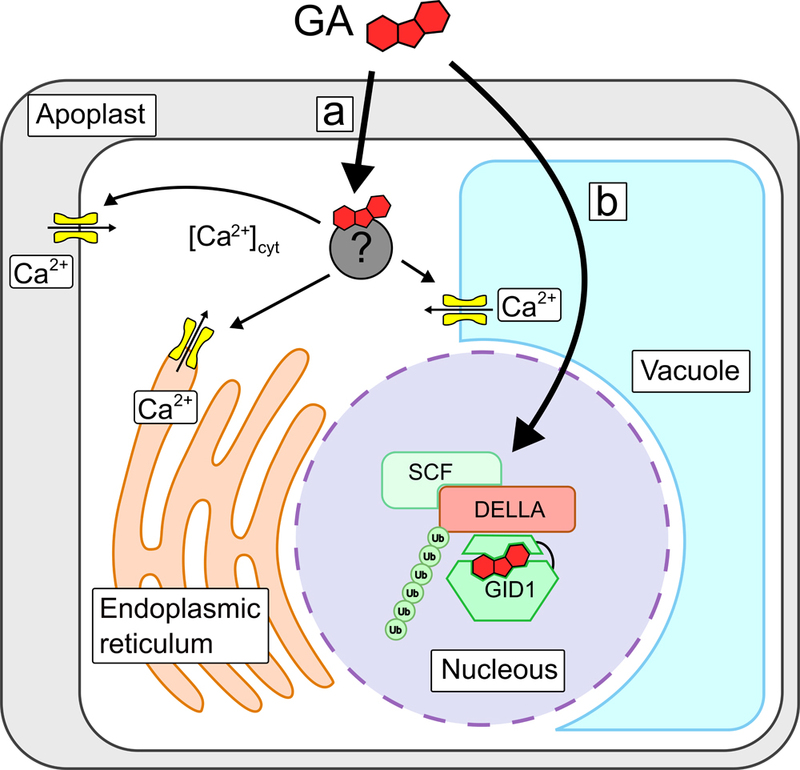 Our data suggest that the GA-induced increase in [Ca2+]cyt depends on the activation of Ca2+ channels via the GID1-GA complex in the cytoplasm. Alternatively, the GID1-GA complex could promote the degradation of Ca2+ channel repressor, allowing derepression of a Ca2+ channel. Another possibility is that an unidentified accessory GA receptor other than GID1 is involved in the GA-induced increase in [Ca2+]cyt. Gibberellin Induces an Increase in Cytosolic Ca2+ via a DELLA-Independent Signaling Pathway.